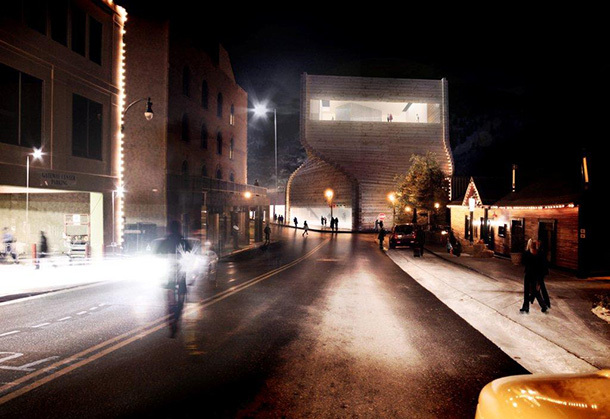 BIG + Architectural Nexus + Dunn Associates + VBFA + Envision Engineering + Big D design the winning proposal for the renovation and expansion of Kimball Art Center in Park City, projected for completion by Mid-2015. 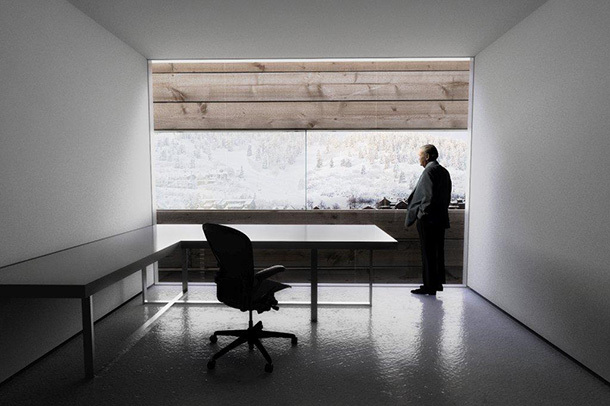 The Kimball Art Center, home to Sundance House during the Annual Sundance Film Festival, invited an international group of architects to submit designs for an interior renovation of the existing Kimball Art Center and the construction of a new building directly adjacent to the original, located centrally in Park City, Utah. The winning project, announced by The Wall Street Journal this past weekend, was selected by an official jury while giving voice to the visitors of the Kimball Art Center – including those who recently attended the ten day Sundance Festival in January. 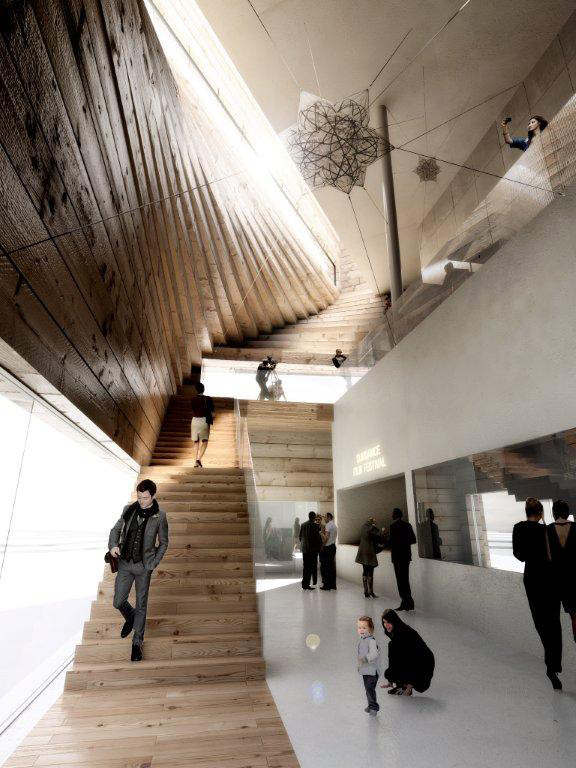 The construction is expected to begin in mid-2013, with completion by 2015. 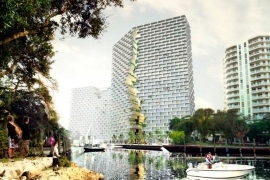 Other finalists included major U.S based offices, including Brooks + Scarpa Architects, Sparano + Mooney Architecture, Will Bruder + Partners Ltd., and Tod Williams Billie Tsien Architects. 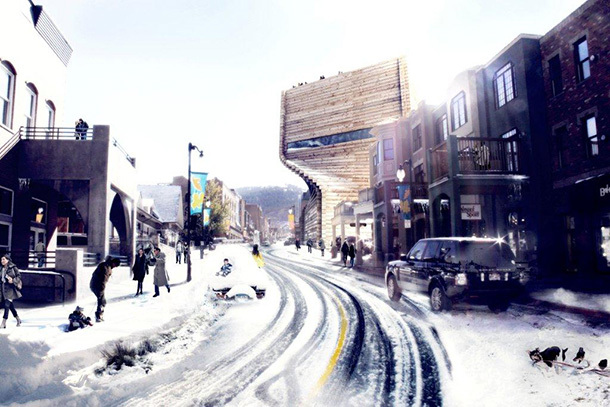 BIG’s design for the new Kimball Art Center, inspired by the urban development of Park City, the Kimball site, and the city’s mining heritage, envisions the building as an anchor for the street life on Main St. and as a gateway and landmark for Park City. The new Kimball is designed with the flexibility, character and personality necessary to become a natural incubator for public life. At 80 feet, the new Kimball Art Center matches the height of the formerly neighboring Coalition Building. 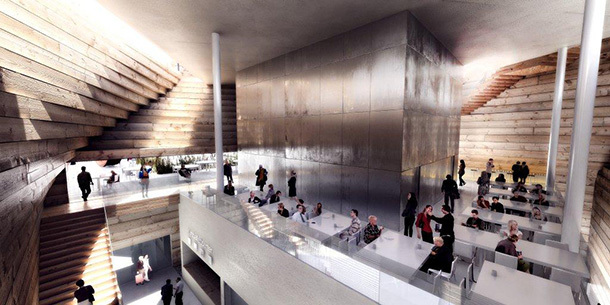 The building footprint and lower gallery sit in relation to Main St. and the city grid, and as the building rises it turns to greet visitors entering the city via Heber Ave, creating an iconic yet contextual building at the city’s doorstep. 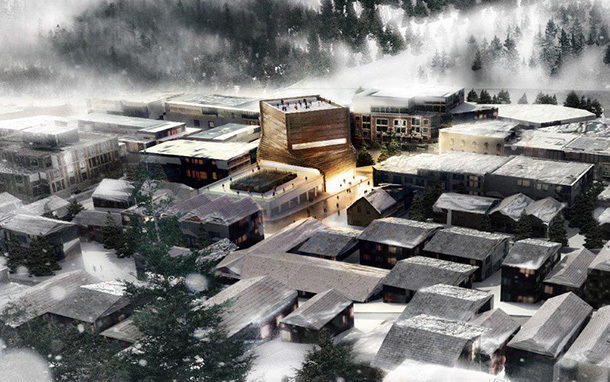 Referencing Park City’s mining heritage, the fa?ade is constructed of massive stacked timber elements, creating an open publicly accessible space inside. 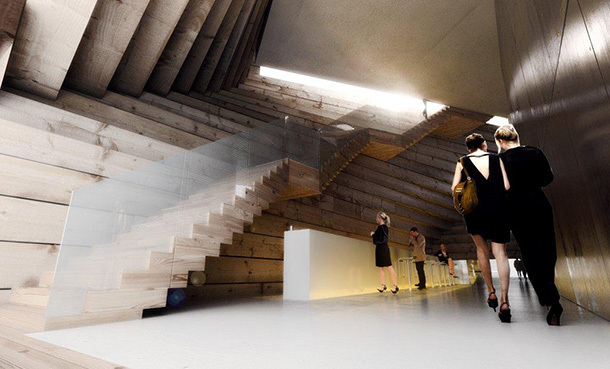 The twisting fa?ade of the building encloses a continuous spiral staircase, leading the visitors from the ground floor to the generous roof terrace, which can be used for outdoor exhibitions and events. 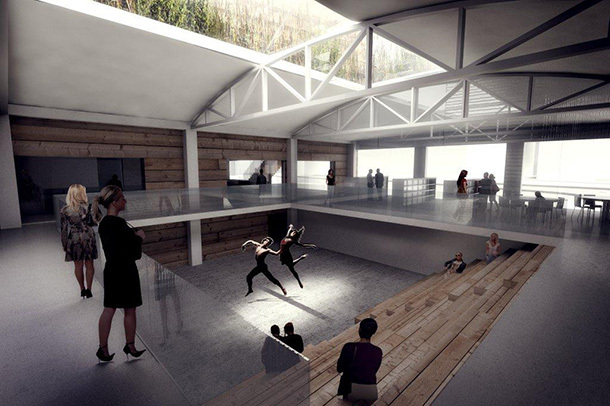 Skylights allow light to wash down the gallery walls below. In between the two galleries is a restaurant, which spills out onto a sculpture garden on the rooftop of the existing, historic Kimball Art Center building. 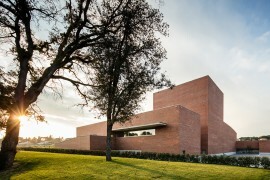 The existing building is converted into an educational hub, complementing the function of the new Art Center. At its heart is a flexible double height auditorium for screenings and exhibitions. During summer, the fa?ade towards Heber Ave opens up to the street and exposes the internal activities. The roof of the existing building is equipped with solar thermal panels concealed by indigenous plants. 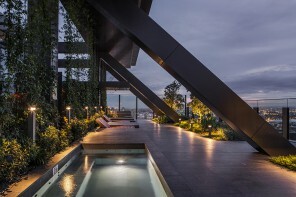 An outdoor sculpture garden loops around the perimeter of the roof. 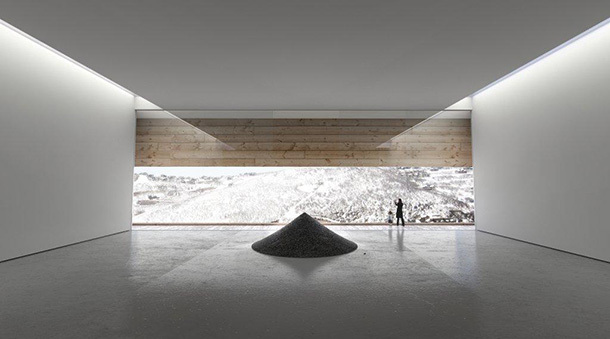 The new Kimball Arts Center takes advantage of Park City’s climate, with an objective to meet a LEED platinum rating by harnessing sources of natural heat, using natural daylight, maximizing ventilation, and recycling rainwater. Generous skylights and large ribbon windows flood the building with diffused natural light, greatly reducing energy costs for lighting. Operable skylights trigger natural stack ventilation. A ground-coupled heat exchanger is drilled deep into the ground in non-built areas. The heat pumps either extract heat from the circulating water in the winter, or reject heat in the summer. Unified twist. 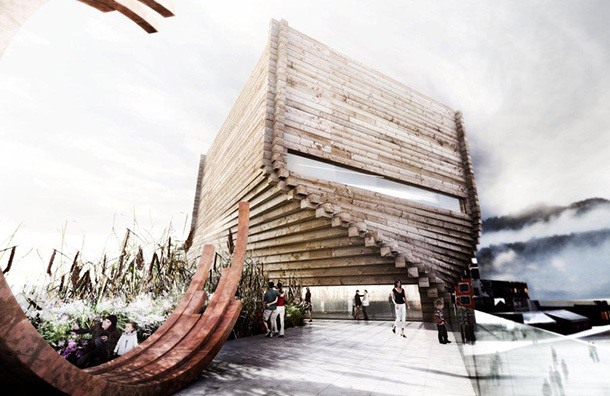 The volumes are blended together to form a unified twisting building – a new icon to Park City. Program. Between the two galleries are administration and restaurant functions. 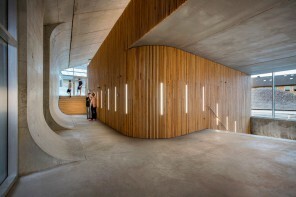 The existing building houses the education program and exhibition support functions.